Travel irons aren’t your typical iron. With a typical iron or steam iron, consumers expect pretty heavy performance. At the very least, they need high heat, smooth surfaces, and hefty steam production. After all, when you have a heavy load to iron, you need as much power within that compact iron frame as possible. Well, when traveling, your expectations and requirements change. Regardless of how well-equipped you are in terms of luggage, lightweight irons are crucial. Even if you are traveling light, lugging a long a heavy iron can definitely put a crimp on your style as you zip from one meeting to another or from one travel destination to another. You need to travel light and easy. With that said, you still require a decent amount of heating and steaming. Not a huge lot but enough to get the job done as you travel. The Russell Hobbs 14033 Travel Iron a great option if this is what you’re looking for. Of course, with the emphasis by travel irons on light weight, there is an offset you must be prepared to accept: you must be willing to iron a little longer since your travel longer doesn’t have as much heating and steam power as the iron you use at home. For most travelers, this should be a fairly small sacrifice to make. 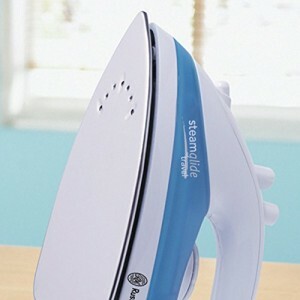 As long as their iron doesn’t take too long, they would gladly trade in some ironing heat and steam power for the convenience and comfort made possible by a lightweight form. As mentioned above, weight is of paramount importance when sizing up different travel irons. Miss this all-important criterion and you might regret your purchase. The great thing about the Russell Hobbs 1 4033 Travel Iron is that it only weighs a very convenient 136 grams. This is a great weight for easy packing, easy usage on the road, and easy transport. While a light weight form is crucial for travel irons, these appliances should have enough water in their tanks to do a decent job steaming. 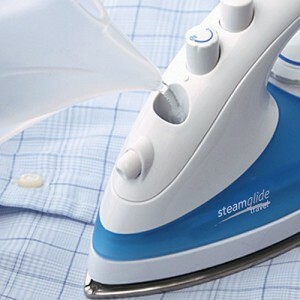 The Russell Hobbs 1 4033 Travel Iron sports a .08 liter capacity water tank. While this seems small, considering the loads most typical travelers iron while out on the road, this should be enough. Granted, it isn’t the category leading volume by any stretch of the imagination. Still, it is enough water to take care of most ironing jobs while traveling. The key to to the Russell Hobbs’ limited tank capacity is to stick to ironing only a few pieces. Travelers normally don’t have a problem with this since they don’t normally carry a huge amount of clothes when traveling-especially business travelers. However, if you see yourself going on a long-term vacation or if you will be staying at a long-term business traveler hotel or lodge, you might want to bring more clothes and this might necessitate another iron with a larger water tank. At 10 grams per minute of steaming power, this Russell Hobbs model is quite decent for light loads. If you are not in a hurry and you’re dealing primarily with light materials or not-so-wrinkled materials, this Russell Hobbs unit’s steam output should be enough to take care of your traveling ironing needs. One of the biggest hassles of using an iron while traveling is the length of the unit’s cord. If you are unlucky enough to get stuck with a hotel iron with a short cord, you might feel that you’re wasting lots of time ironing with a limited range of motion. Pair this with a heavy iron and you can have quite an annoying or frustrating ironing experience on your hands. Thankfully, this Russell Hobbs 14033 unit spares you from all the frustrating hassles of having to make do with a small cord. Instead, this unit gives you maximum range of motion. Why? Not only is this unit very light, this unit is also completely cordless. 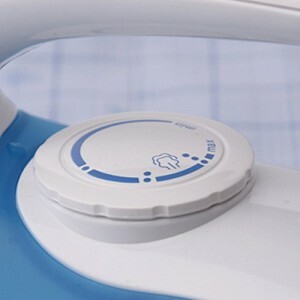 This means you can work special angles or alternate between different ironing angles so you can finish your ironing load as soon as possible. Considering that most travelers would rather iron in as little time as possible, this unit’s cordless design is definitely very welcome. 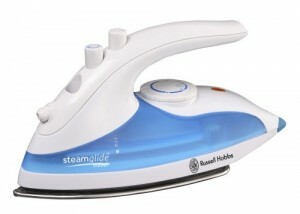 If you think the pairing of light weight and cordless design is great, this unit can also be used to steam vertically. Talk about convenience in one very nifty compact form! There is no such thing as a perfect product. Every product has a drawback. Well, when it comes to the Russell Hobbs 14033, its Achilles Heel is its soleplate. Considering the fact that your home iron might be using a ceramic soleplate, it seems like a step down when you have to use this Russell Hobbs unit. After all, it uses a standard stainless steel soleplate. You might have gotten used to the gliding sensation you get when ironing loads at home. After all, such ultra smooth soleplates make ironing even large loads easier to handle and faster. The good news is that when you are traveling, your ironing loads probably won’t get very big. After all, you are zipping from Point A to Point B and just need to iron just enough clothes as you wind up your itinerary. You don’t need to iron a huge volume of clothes on the road. In this context, an iron soleplate and its drag on the surface of the materials you’re ironing plus its weight might not slow you down to the point it becomes frustrating. Again, we need to look at the overall context of any iron’s use to appreciate the full value it brings to the table. If you are looking for a truly convenient iron you can use on the road reliably, you might want to consider this Russell Hobbs 14033 Travel Iron. As long as your travel ironing loads aren’t very heavy, this mini guy should be enough to take care of all your ironing needs when traveling. I especially appreciate the fact that it is cordless. You get maximum range of motion and convenience in one sleek efficient package.